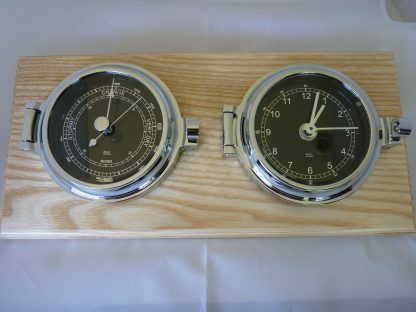 PRESTIGE Retro Clock and Barometer set. Solid ash plinth. 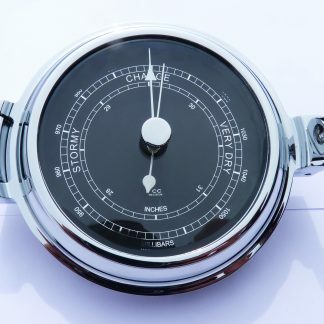 Prestige Marine Range. Instrument case is cast brass with beautiful, top quality chroming with bevelled glass. Lacquered and varnished, virtually maintenance free. Hinged door design allows easy access to instrument mechanism for any necessary adjustment, fitted with rubber sealing ring. 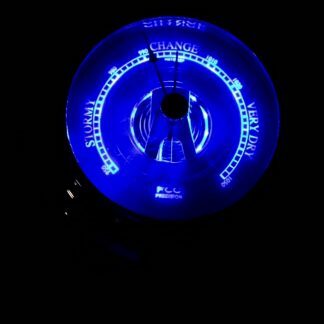 Quartz driven clock. Suitable for marine installation. Stunning purchase for boat/home or a special presentation gift. Please note the Time & Tide Clock should not be relied upon for navigational purposes. 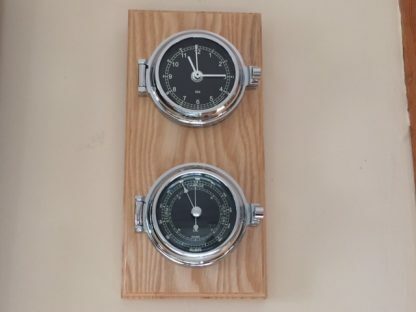 Can be mounted vertically, if preferred. Add under “note” on order. 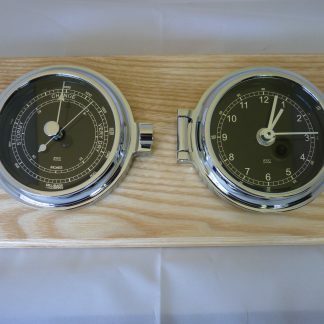 PRESTIGE Retro Clock and Barometer set. Marine quality chrome mounted on solid ash plinth. Prestige Marine Range. 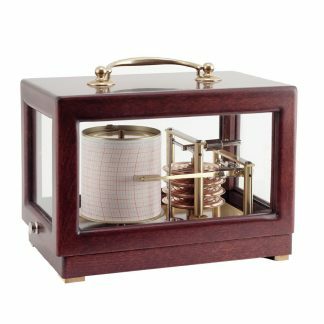 The Clock and Barometer instrument case is cast brass with beautiful, top quality chroming with bevelled glass and fitted rubber sealing ring. Lacquered and varnished, virtually maintenance free. Hinged door design allows easy access to instrument mechanism for any necessary adjustment. Quartz driven clock battery provided. 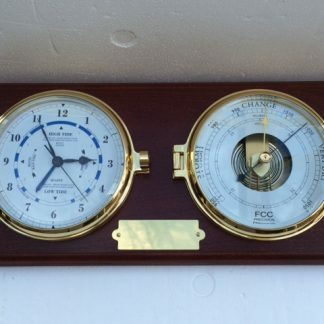 Historically sailors would read and log the barometer pressure reading on an hourly basis! This chrome Clock and Barometer set looks equally stunning installed on a boat or in the home!